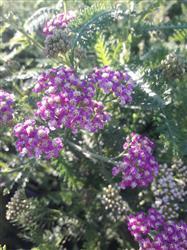 Achillea millefolium 'Island Pink'is a perennial Yarrow that spreads by rhizomes. Island Pink is native to Santa Cruz Island and is distinguished from our common White Yarrow by its bright pink flowers. Dark green foliage is topped with clusters of bright pink flowers on 1-1/2' tall stems, over a long season. Best in full sun if coastal, part shade inland. Tolerant of drought, swamp and alkali conditions, or rocky to clay soils. This is a nectar plant for butterflies and other pollinators. Plant in meadows, or flower borders for a splash of color. Good habitat value, providing nectar for bees and butterflies. The foliage is deer resistant.